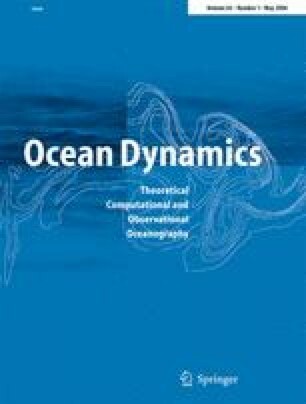 Storm-related sea level variations 1958–2002 along the North Sea coast from a high-resolution numerical hindcast are investigated and compared to the results of earlier studies. Considerable variations were found from year to year and over the entire period. The large-scale pattern of these variations is consistent with that derived from previous studies, while the magnitudes of the long-term trends differ. The latter is attributed to different analysis periods, improvements in the atmospheric forcing, and the enhanced spatial resolution of the numerical simulation. It is shown that the different analysis periods, in particular, represent an issue as the increase in storm-related sea levels was found to be weaker over the last few years that have not been included in earlier studies. These changes are consistent with observed changes of the storm climate over the North Sea. It is also shown that observed and hindcast trends may differ significantly. While the latter are in agreement with observed changes in the storm climate, it may be concluded that observed sea level changes along the North Sea coast comprise a considerable fraction that cannot be attributed to changes in the large-scale atmospheric circulation. We are grateful to the British Oceanographic Data Centre (BODC) who provided us with tide-surge data from Aberdeen. Data from Borkum and Cuxhaven were provided by the Bundesamt füur Seeschifffahrt und Hydrographie in Hamburg. The work was funded by the European Union under the HIPOCAS (Hindcast of Dynamic Processes of the Ocean and the Coastal Areas of Europe) contract EVK2-CT-1999-00038. The numerical simulations were performed at the BAW-AK. We thank Mrs. Beate Gardeike for preparing some of the figures for us.